Just as a rising tide lifts all ships, newfound support and awareness of the corrosion risk within the maritime industry should lead to greater demand for corrosion expertise. That’s the outlook from NACE International’s Chief Maritime Officer Buddy Reams, who called on attendees at CORROSION 2019 to become more engaged with the maritime sector in a Tuesday presentation at the Exhibit Hall’s Blue Theater. 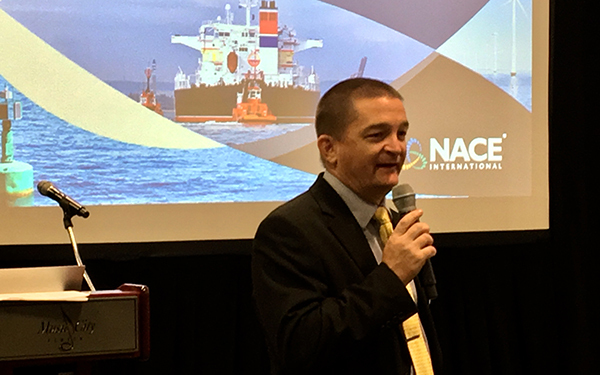 Titled “Mobilizing NACE Expertise for the Maritime Sector: A Call to Action,” Reams used the 30-minute session as an interactive opportunity to answer questions and simultaneously encourage all of those in attendance to get more involved. As a former U.S. Coast Guard marine safety professional,Reams explained that his goal is to transition the industry into more proactive means of corrosion prevention. Reams pointed to biofouling management as one niche within the maritime industry where more expertise is needed. He also cited two NACE Task Groups (TG) – TG 576 for “Drydocking Hull Surface Maintenance and Repair”and TG 575 for “Corrosion Prevention and Control of Marine Scrubbers” as opportunities for further advancement. For more information on maritime, visit NACE’s new Maritime News publication for information specific to the industry.